5000 litre corrosion resistant poly water tank for maintenance free service. Checker plate pump deck allows for easy refuelling and hose storage. A large 2″ hose fitted with BSP camlocks for easy connection. to allow supply of water the windrow turner as it moves. 2” male BSP camloc ports for fill/discharge of water. The WT5000 Water Wagon can also be fitted with spray arms for spraying or wetting down dirt roads whilst being towing, or firefighting. Transporting water around the property becomes a breeze as the WT5000 can pump water directly from a dam or creek. By connecting the WT5000 Water Wagon to a CT Series Windrow Turner, water can be pumped whilst the Windrow Turners is in operation. By using the turner’s built watering system to allow you to water evenly whilst aerating the windrow in one pass. Towing WT5000 via the Windrow Turner’s offset towing arm that is specifically designed for the WT5000, turning this to a “one tractor – one person” operation saving time and fuel. Another major benefit is that it allows you to add composting starters and additives to the windrow sprayer during turning at the precise rate to achieve the maximum efficiency of composting. 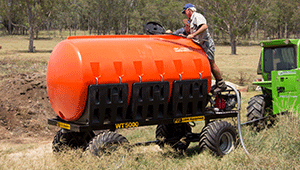 Every WT5000 Water Wagon is designed and manufactured by JPH Equipment in Brisbane Australia. JPH Equipment have been designing and manufacturing quality equipment for over 25 years. As small business, we have the ability to respond to your needs at all times throughout the design and manufacturing process and provide innovative solutions, and we are happy to work with your unique requirements. We keep our relationships with our customers personal and transparent, and our capabilities in design and manufacturing make sure you’re receiving the same depth and breadth of technical expertise that you’d typically find in a larger organization.